You will earn 5,388.77 Reward Points. Earn 1 reward point for every 1 dollar spent. 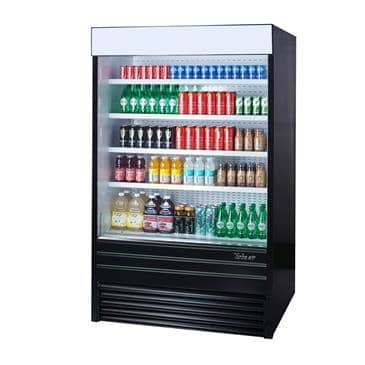 The Turbo-Air TOM-36EB-N is a self-contained refrigerated merchandiser intended to entice your customers to make impulse purchases. The open front design provides convenient, quick access to your products so customers can easily pick them up and pay for them at the counter. This unit’s exterior is protected against rust and damage by a coat of non-peeling, anti-corrosion black paint. The galvanized steel interior is white-coated to keep your products safe from rust. At 36” wide, the Turbo-Air TOM-36EB-N has a full capacity of 11 cu. ft to provide plenty of room for displaying bottled drinks, baked goods, and pre-packaged salads and sandwiches. The interior comes with (4) adjustable white-coated solid shelves that allow you to organize your products systematically. Optional price tag channels are available for an extra fee. Energy-efficient interior lighting provides bright, eye-friendly illumination so that customers can view your items with comfort. LED lighting lasts significantly longer than fluorescent lighting while using up much less energy. This merchandiser uses foamed-in-place polyurethane insulation to ensure the cool air remains inside. A night curtain provides a secondary barrier to prevent warm air from seeping in during slow times or after-hours. The Turbo-Air TOM-36EB-N uses Turbo-Air’s signature patent-pending self-cleaning condenser that is equipped with a rotating brush which automatically moves up and down the coil 2 to 3 times per day. This not only minimizes the need for frequent cleaning, it also ensures that the system is dust-free and operates at maximum performance consistently. The unit’s interior back wall and top have perforations to allow better airflow and ensure balanced cooling all throughout the interior. A standard back-guard also contributes to better airflow. This merchandiser has a built-in thermostat with defrost control to let you adjust the temperature to optimal levels. A solar-powered thermometer provides an easy way to monitor the temperature and make sure it is at safe and constant levels. The Turbo-Air TOM-36EB-N is in full compliance with the strict new standards on refrigerant use mandated by the EPA and DOE in 2017. It is cooled using R290, a hydrocarbon refrigerant that is registered with an Ozone Depletion Potential of 0 and a low Global Warming Potential of 3. This means R290 does not deplete the ozone layer and has a very small contribution to global warming. This unit is powered by twin 3/4 HP compressors. It has a voltage of 115v/60/1-ph. The Turbo-Air TOM-36EB-N is certified by CSA-Sanitation and cCSAus.